In collaboration with BTCN.asia, an online business and finance media outlet, we produced a video showcasing 9 of our members as they share more about their company background and insights about the Fintech ecosystem in Singapore. For more of our video content, do visit our YouTube channel by clicking on the link above! This was definitely a night to remember! 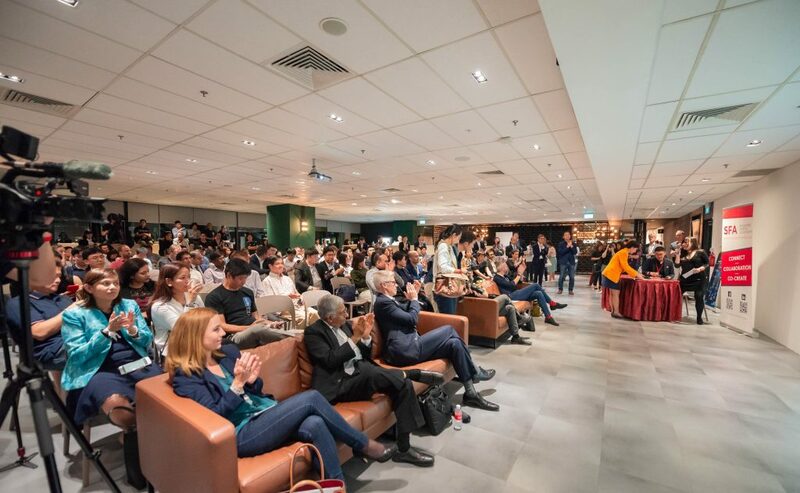 350 attendees comprising of SFA members and international partners came together at 80RR Fintech Hub SG, to celebrate the development of Fintech. It was also a night where new friendships were forged and old friendship rekindled. The night started with Mr Diwakar Gupta, Asian Development Bank's (ADB) Vice-President, as he shared about ADB's vision, strategy and digital transformation journey. He also encouraged startups with innovative development tech solutions to join ADB in their efforts to promote social and economic development in Asia. Managing Director of UOB, Ms Janet Young took the stage next to launch the joint publication with SFA; Fintech in ASEAN - The Next Wave of Growth where she talked about the importance of SME in the fintech and digital revolution. Several other speakers included Mr Ozzeir Khan (ADB), Mr Marc Lepage (ADB), Till Bruett (UNCDF) and Thomas Krogh Jensen (Copenhagen Fintech). For more similar reports, do click on the link here! The Asian Development Bank was conceived in the early 1960s as a financial institution that would be Asian in character and foster economic growth and cooperation in one of the poorest regions in the world. ADB assists its members and partners by providing loans, technical assistance, grants, and equity investments to promote social and economic development. ADB is composed of 67 members, 48 of which are from the Asia and Pacific region. More highlights of the night can be seen in the video below! In collaboration with our Japanese counterpart Fintech Association of Japan (FAJ), we organised a sharing and networking session for our members. More than 100 people attended the event where Japanese Fintech companies presented about their companies followed by a panel discussion where experts from both sides discussed the challenges and opportunities surrounding the Fintech landscape in both Singapore and Japan. Fintech without borders. Singapore, despite its small market, can play a pivotal role in the global development of Fintech. SFA’s strategic alliances and partnerships with international grassroots and government organizations would be able to contribute to this cause. More importantly, these partnerships will give us the opportunity to better support and facilitate our members as they venture overseas. Partnership to work on joint initiatives, to promote social and economic development in ASIA.